If the temperature is high, and the air humid; if the light has mellowed to a creamy custard; if the traffic noise has softened from its late afternoon fury; and especially, if there is a zephyr that turns the sweaty glaze on my neck and forehead to a soothing unction; if all these atmospherics are present and, if I shut my eyes, I can almost, almost, be back there . Behind my eyelids I can raise my sight upward and there it will be, a building as stately and as glorious as the goddess for whom it was built. Time and circumstances may have re-defined, but not diminished, the essence of its beauty. The Parthenon is, after all, the virginal Athena’s abode. In my mind’s lens I can pull back the focus, widening the frame, drawing back down from the Acropolis, across the scattered ruins in the ancient Agora, right back to my table opposite theTaverna Pente Adelphoi. In wide-angle I can now see my fellow travelers, pulling open their collars and sleeves to accept a zephyr’s blessing. I can almost reconstruct the aroma of the Greek salad, feel the texture of the yeasty,coarse bread, and hear one of my companions remark with surprise and equivocation at her first taste of retsina wine. And I can’t help myself remarking at the coincidence that this street, Eolou St., should be named for the ancient Greek god, Aeolus, whose harp strummed up the earth’s winds. 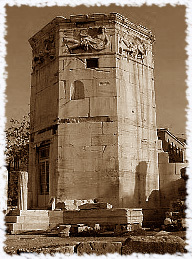 Perhaps it received that name because, nearby, just a few metres from our table stands the Temple of the Four Winds; as though from here, in this area of Athens called the Plaka, a little octagonal temple issues forth all the world’s air currents. In this particular location, more than any other that I can bring to mind, and experience the sublime experience of the nexus of time, place and people. For me, foreign travel just doesn’t get much better than such conjunctions. There are other ‘coordinates’ that might qualify nearly as well, and each traveler has his or her own particular and special mnemonic souvenirs; but this surely is one of mine. Here I feel just that little bit more both “alive” and yet humbled by the sense that my personal existence is an historical hiccup. It is, paradoxically, a pleasurable memento mori . 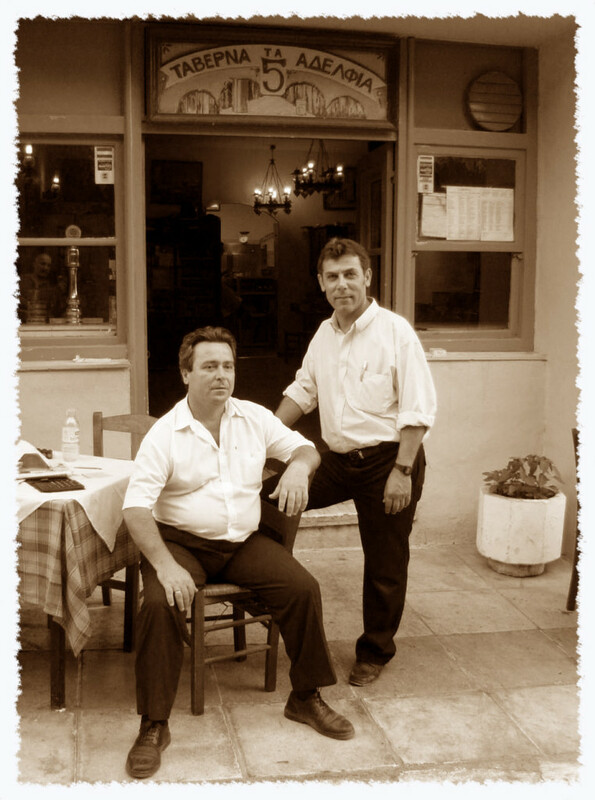 I have been at these tables in the Plaka many times, with many friends, family members and fellow travelers. It has seemed in those times, as it does in my reverie, that for brief moments our secular existence is transformed by that ancient Greek sense of an immediate and proximate divine dimension. That breeze that lifted the tablecloth, rustled the vines hanging over the wall and cooled our humidity-glazed skin, was it the strum of some long ago Olympian harp? Who can say. Somehow the memory strives to connect this bustling, smoggy, noisy and commercialized quarter of Athens with the Greece of Homer, of Plato. Or, Philhellenes like Byron, or Kitto, or Mary Renault. But even they can only help prepare one for what must be our own encounter, our personal discoveries, with a place and its times. The essence of travel memory is not composed of the iconic, of what is consensual, or what is the distilled imagery of the National Tourist Office. To the contrary, the personal discovery may stand for the general, but it is a particular, an aide-memoire, that assists the senses in re-calling the flavors, aromas, and textures of the place, and to situate that memory at a particular point, not just ‘in time,’ but in our ‘ life-time’ . Perhaps it is fitting to situate these thoughts on travel and memory in Greece. It is from here that our knowledge of the Classical world was handed down by tradition, by the spoken and chanted histories that only later were taken down in writing. It was also a fellow Greek of the same age, the historian Herodotus, often referred to as “the father of history,” who, through his accounts of the places as well as the events he observed throughout much of the known world of his time, can legitimately claim to be the first “travel writer.” The Temple of the Four Winds came to be built later, and the Taverna Pente Adelphoimuch, much later; but I’ll bet old Herodotus also knew the pleasures of sitting with friends in a place rich in history, sharing Greek salad and bread and wine, and the blessing of a cool breeze. Foreign travel just doesn’t get more “classical” than that. It was a meteorological station built by the Syrian Astronomer Kyrrhestes in the first century with a hydraulic clock and a mechanical device that represented the sun, the moon and the five known planets. The frieze depicts the winds and their personalities.